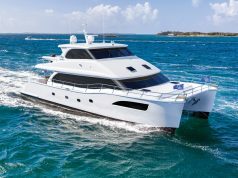 BIMINI LIES JUST 50 MILES off the south Florida coast, so it is a popular destination for boaters, as well as a welcome stop on the way to the central Bahamas. The two major islands— North and South Bimini—are at the western edge of the Great Bahama Bank with shoal waters to the east and the deep Straits of Florida to the west, where the Gulf Stream runs close offshore. This ideal combination makes Bimini one of the world’s greatest sportfishing locations. The same geographic circumstances foster a prime habitat for many shark and ray species. In turn, they drew Dr. Samuel H. Gruber to the area to establish the Bimini Biological Field Station Foundation, known as Sharklab (biminisharklab.com). “Doc” is a renowned expert on these species and has had a long career studying their biology and behavior. After receiving graduate degrees from the University of Miami and doing post-doctoral work in Germany, he led a number of research programs both in the laboratory and in the field. In 1990, following many years of commanding research vessel cruises, he created his own field station. And now, you can go diving with sharks to learn more about the creatures. 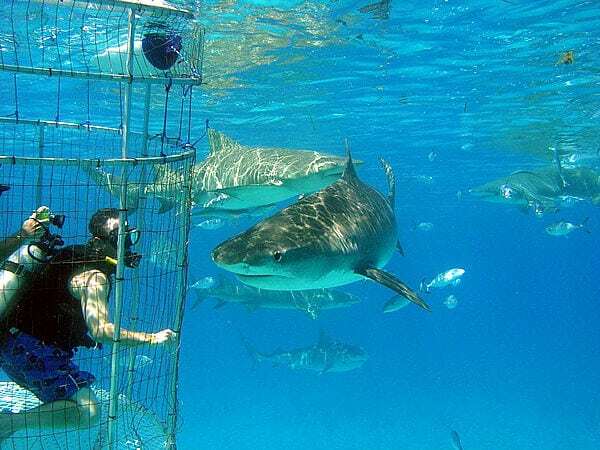 Many of its activities involve the temporary capture, biological assessment, tagging, and release of sharks in both shallow and deepwater environments. Modern tagging technologies are helping researchers track the movements and interaction of sharks throughout the Atlantic basin, with Sharklab making important contributions to these efforts. The most advanced of these sensors broadcast position data to a satellite, which allows scientists to monitor the subject in real time. In 2012, Sharklab helped apply these tags to a group of tiger sharks, each of which measured more than 10 feet long. As part of its outreach, Sharklab offers tours of the facility, including the captive shark pens, along with an introduction to its research. Tours are timed to coincide with low tide and are subject to weather and research constraints, so advance arrangements are required and donations are accepted. Contact the lab on VHF 88A, at (242) 347-4538 or tours@biminisharklab.com. The lab is just 1.4 miles south of the South Bimini Ferry Dock and less than a mile from Bimini Sands Resort & Marina—easily walkable if you are so inclined or just hail a cab on VHF 68. If you want to go diving with sharks in Bimini, and get a unique and in-depth introduction to Sharklab’s work, consider booking a five-day Research Experience. Price includes round-trip charter air from Miami, accommodations, and meals. 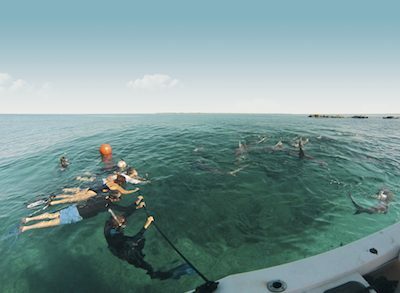 You will learn to handle captured sharks, snorkel mangrove nurseries and coral reefs, shadow a Ph.D. for a day, and interact with staff and students virtually 24/7. For more information, go to biminisharklab.com.